Rusape is located in the northeast Zimbabwe, about 120 miles (200 kilometers) from Harare. The community claims both an ancient and modern Jewish heritage. The Jews of Rusape believe to be the descendants of one of the lost tribes of Jacob. These people are believed to be offspring from the Bantu people who came from Northern Africa. Almost 2,500 years ago, after the destruction of the Temple, a group of Jews left Judea and settled in Yemen. When the economic situation in Yemen began to fail, the Jews left and moved to Africa; with one group settling in Ethiopia and the other in Tanzania. After several years, many Jews left Ethiopia and moved further south into what today is Zimbabwe. 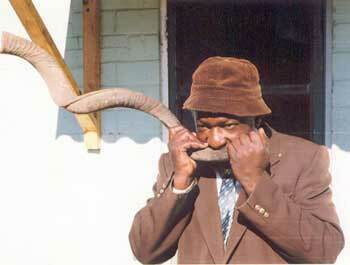 They became known as the Ba-Lemba. Today, there exists a Lemba Cultural Association attempting to bring all the various Lemba communities in South Africa, Mozambique, Ethiopia, and Zimbabwe together. Within the past few years, extensive research has been done on the Lemba communities. These tests verify that many male “Black Jews” have the same genetic structure as the Cohen priests, providing evidence of the relation to Jews of this ancient heritage story. The Jewish community of Rusape can date itself back to 1903, when an African American Baptist deacon named William Saunders Crowdy met Albert Christian. Although, Crowdy was deemed a deacon of the Church, in the 1880s he had a dream where God instructed him to lead the blacks to Judaism. Crowdy passed his Judaic teachings and traditions onto Christian; afterwards, Christian settled in Southern Africa where he preached about Judaism. 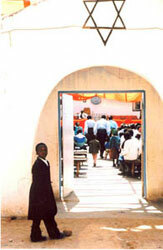 Today, Congregation Betel in Rusape consists of thousands of members, approximately 4,000 people. Rabbi Ambrose “Cohen” Mukawaza leads the community in services and studies. In 1938, the Congregation Betel synagogue was built about seven kilometers (4.34 miles) outside the Rusape city limits. Every Saturday, the building is packed with more than a hundred Jews practicing “prophetic” Judaism. Originating in Virginia a little over a century ago, the practice is associated with African American Beth El Congregations. The main belief is that while Jesus was not the messiah, he was a prophet, as was William Crowdy who delivered the word of God. This congregation believes that while the teachings of Jesus should be respected, Jesus was an active member of the Jewish community of Israel. Besides this difference in Western Judaism, the Rusape community observes all Jewish holidays and prayer services are conducted in Hebrew. One of the Rusape congregation’s high holidays is the Convocation of the Feast of Tevet. This holiday remembers the destruction of the Temple and the migration of the Jews from Yemen into Africa. For eight days the community remains together, with prayer services beginning at 4 a.m. Each day the congregants pray to God in a different position: from standing on the first day to lying on the floor on the eighth day. 1. Belief in only one God, and that he created all things. 2. 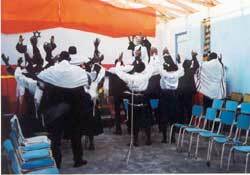 One day a week is considered holy: On this day the Rusape Jews give thanks and praises to God. 3. Strict observance of Shabbat. 4. Adherence to the Ten Commandments. 5. A bris is performed according to local African tradition, at the age of ten. 6. When praying, a choir melds Shona (the local Zimbabwe dialect), Hebrew, and English words into African melodies to create a distinctive service. Nevertheless, the services contain almost all the traditional Jewish prayers found in Western siddurim. 7. They do not eat pork or any other animal prohibited by the Old Testament; nor do they mix milk and meat. All animals are slaughtered by a professional “kosher” butcher and bled thoroughly. 8. The calendar follows the path of the moon. 9. Stars of David are engraved on tombstones. 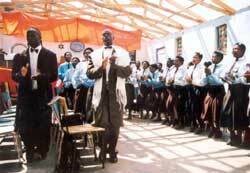 The Zimbabwe Orthodox Jewish community does not recognize the Rusape Jews as Jews. Although, the Rusape Jews may have good intentions, according to the Orthodox community they cannot claim to be Jewish until internationally established as Jews.